Pandanus Park was established predominantly for Vietnam Veterans However your Committee recognize that through the goodwill of the Traditional Owners of Kalpowar Station Australian Defence Force VETERANS from all conflicts are welcome. The Pandanus project commenced in 2001 in response to a call for Vietnam Veterans to occupy a portion of land in the southern section of Kalpowar Station on the Normanby River adjacent to Lakefield National Park, on Cape York Peninsula. It was hoped that this land, known then to the veterans as the ‘Green-ant Block’, could be acquired from the Government for Vietnam Veterans to use as a retreat – a concept that was widely accepted within the veteran community. With this in mind in May 2001 an advance party of nine veterans settled, squatted or camped on the ‘Green-ant Block’ constructing a rough frame of a ‘building’ as a proposed shelter and central meeting place. This structure became known as the Base Camp or HQ and indicated the veteran’s resolve for long-term occupancy or use of the area. At the same time the veterans established individual camp sites, explored the area and enjoyed the serenity of the location for approximately three weeks. Around this time they also began the construction of a simple concrete memorial to honour those who died in combat in Vietnam. This would become the focal point of the annual Long Tan Day or Vietnam Veterans Day memorial service. The chosen section of Kalpowar Station was unallocated Government land with the EPA appointed caretakers of the area in 1996. Thus an unallocated slice of government land with no ‘owners’ seemed ideal for the veteran’s needs especially since Kalpowar Station had a considerable 'military ' history having in part been a soldier’s settlement block. Kalpowar Station itself was large, covering an area of approximately 409,400 ha and measuring some 90 kilometres by 30 kilometres prior to its sub-division in 2005 when sections were allocated to the EPA, to the National Park, and to the Kalpowar Aboriginal Land Trust in response to a native title claim. The initial concept of ‘squatting’ on Government land to establish a veteran’s retreat or reserve was strongly opposed by the government and others resulting in considerable confrontation and at times adverse publicity yet during these early years numerous individuals and groups continued to lobby the government for a veteran specific retreat whilst others persisted in occupying the ‘Green-ant Block’, albeit with support from within the veteran community and an increasing number of the general public. Finally in 2004 the government accepted the call for a veteran specific retreat despite having first rejected the concept. The land was already under native title claim. The government could not grant the land without a specific act of parliament which both the government and the opposition was not prepared to countenance. The veterans could not afford the many and varied costs associated with the grant of ownership of a property of this size. Property could not be granted to or owned by other than an individual without an incorporated body being established. By early 2005 the aim of achieving legal access, grant or ownership of Kalpowar or part thereof had stagnated with continued adverse and at times confrontational publicity not helping the Veteran’s cause. Furthermore there remained division within the veteran community as to how best to proceed. In the meantime the veteran’s use of the ‘Green-ant Block’ continued with the numbers camping thereon growing each year. 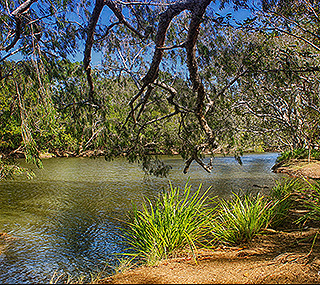 Pandanus Park is operated under a Deed of Licence from the Traditional Owners, the Kalpowar Land Trust.